The created XML file can be read, processed by any third party application, script - and this allows integrators, developers to display, store, process any detected information and make custom actions, logging based on that. Generally the information in the XML file is similar which saved in a text / HTML report (saved by using the Report menu in Hard Disk Sentinel), just in different XML format. 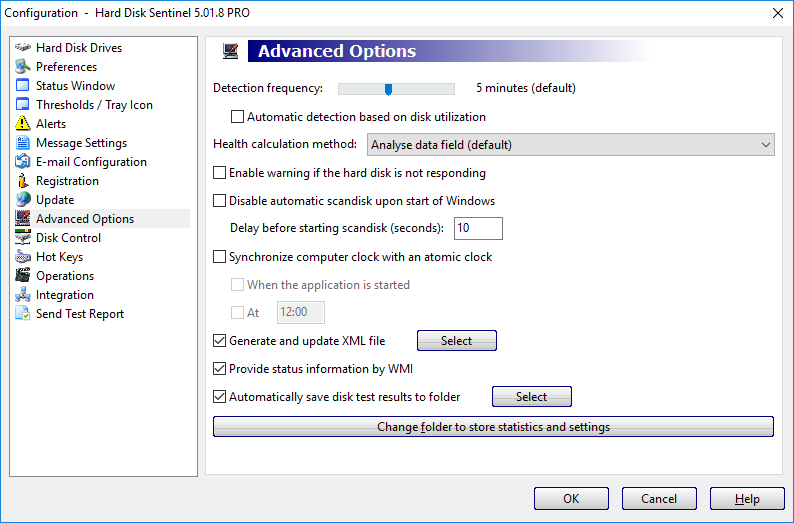 Registered (complete) Hard Disk Sentinel version required to be installed. Enable Configuration -> Advanced Options -> Generate and update XML file. By default, this saves HDSentinel.xml file in the folder where the software installed. By the button next to the option, it is possible to select the target location of the XML file. The XML file updated automatically based on the configured detection frequency (which can be adjusted by the slider on the top of the Advanced Options page, by default once per every 5 minutes). Alternatively, the complete status in XML reports can be read over the network (internet) via HTTP, from any web browser or tool downloading web traffic (for example wget). For this, please enable Configuration -> Integration -> Enable WebStatus option - and then it is possible to read the complete report by entering http://computer-name:61220/xml in any web browser, where computer-name is the name (or IP address) of the actual computer. The created XML report can be read, processed differently based on the actual requirements. There are Add-ons available, using this technique, for example the Remote PC status gadget and the Nagios integration. Just open notepad, copy/paste the following code and save the file as hdsentinel-xml-demo.vbs in the folder where Hard Disk Sentinel saves the XML file. 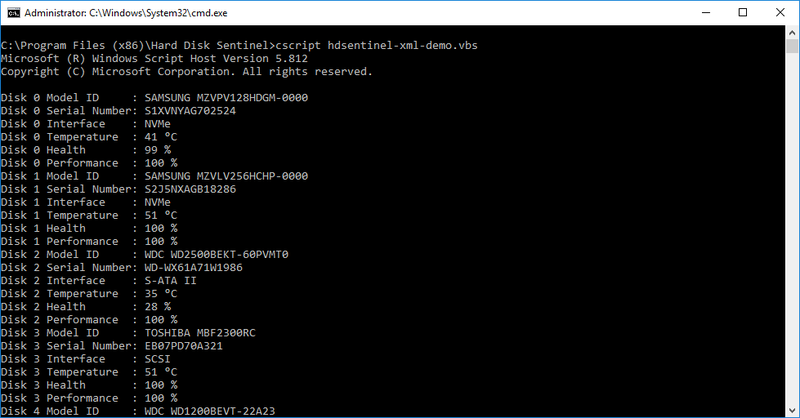 Then double-clicking on the hdsentinel-xml-demo.vbs file (or by starting cscript hdsentinel-xml-demo.vbs) gives the details from the XML file. Quote from Ken Wallewein (Thanks for his hard work and sharing the information): "PRTG offers direct XML reading functionality. Here's some example PowerShell code that shows the XML need. " It may be good idea to combine XML output with other functions, for example the WMI function, when status information can be read by WMI queries, from local or remote computer.